Fake sheep skin is easy to burn due to chemical fiber. Therefore, it is weak to heat and it is nondurable. 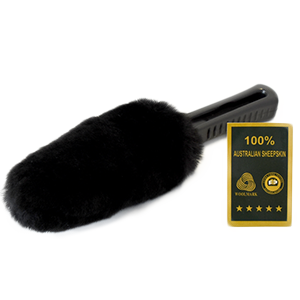 Pika Pika Rain Wheel Brush is made of REAL Australian sheep skin. It is high water retaining capacity and nice absorption oil stain, so you can clean up every gap in wheels. It is made to hold and use easily. For washing wide parts, you can hold it horizontal, and the other hand, for washing narrow parts, you can hold it vertical. Pika Pika Rain Wheel Brush doesn’t drag sands and dirt like a sponge on the surface of wheels, so it can wash wheels gently and can make less scratches.